Hundreds of locals queued to be one of the first to glimpse the brand new three-storey shopping destination, which is home to a fabulous collection of fashion, beauty and homewares. Megan, 26, was chosen to cut the ribbon, alongside Julien Macdonald, following a call out for local residents to nominate a community hero who is an inspiration and has made a valuable contribution to society. Megan was nominated by colleague, Gill Nightingale who said: “Megan is the most inspirational person I have ever met. She is full of energy and is the most incredible ambassador for Watford Workshop. She has embraced the challenge of fundraising with a passion and professionalism that far exceeds her years. Megan said: “I am overwhelmed at being chosen to open the store. I have had such a lovely morning with Julien and the personal shopping team, picking out outfits and cutting the ribbon to the store. It looks fantastic and I’m sure I’ll be back for a spot of shopping very soon! Born in Durban, South Africa, Megan’s life changed forever when she fell off her bike during a family holiday in the UK at aged seven. The fall caused a massive brain haemorrhage and left her with a permanent disability. She continues: “In a split second, our lives and our plans for the future changed forever. I managed my disability through my schooling and enjoyed a full and happy life. It was only once I had left school that my disability became a problem as I could not get a job. The self-esteem and confidence I’d built up through my happy school years quickly shattered and my mental health suffered. The 86,000 square foot Debenhams Watford store is home to a mix of exclusive designer collaborations, own label and international brand fashion and home ranges alongside leading beauty brands. It is the first in the country to feature Debenhams newly redesigned Beauty Hall of the Future which is modern, easy to navigate and houses interactive space where customers can browse, discover and experiment with products from established beauty houses and breakthrough brands. The new hall also brings Watford shoppers 24 new exciting skin, make-up, men’s and haircare brands to the area including Bean Body, Filorga, La Bruket, Ciate, House 99 and Bumble & bumble*. Visitors to the company’s newest flagship store will also have the chance to sit down, relax, and grab a bite to eat at the store’s Loaf & Bloom restaurant and Costa coffee. Additional highlights include a beauty bar powered by blow LTD., a Benefit brow bar, a bra fit service, a personal shopping team, travel money and free Wifi. Local Debenhams Beauty Club cardholders will also be able to take advantage of the new ‘Treat Me Tuesday’ offer where they can get a free beauty treatment every Tuesday. 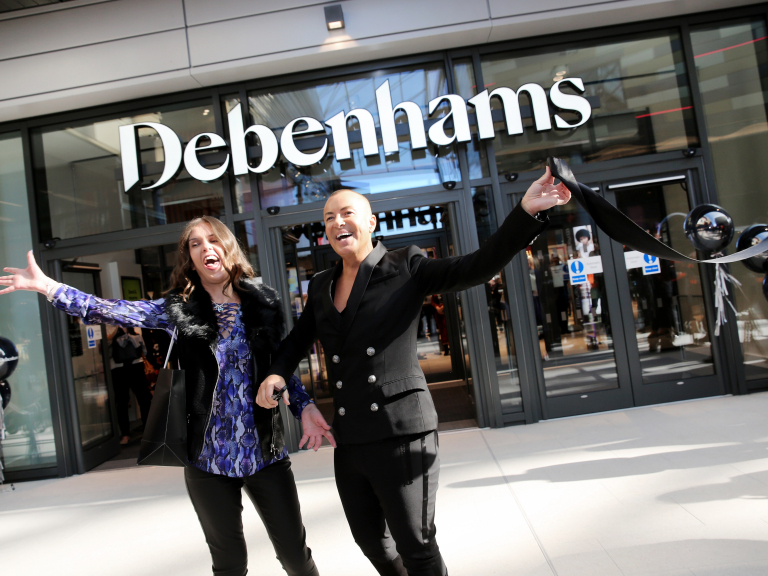 Tony Hurley, store manager for Debenhams in Watford said: "It’s fantastic to finally open our doors to the public, having been working behind the scenes for so long. “It was amazing to see so many members of the local community outside the store this morning, and it was a pleasure to have Megan cut the ribbon alongside Julien. She looked absolutely beautiful.